The dry algae of plant Sargassum pallidum (Turn.) C. Ag. or S. fusiforme. (Harv.) Setch. of family Sargassaceae. Fishy smell, lightly salty taste. 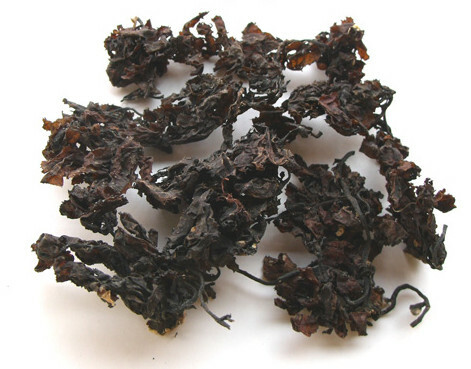 Dry, black and brown, less salt efflorescence, tender twig, without sand. This herb can remove phlegm, soften hardness and dissipate nodulation mainly indicated for scrofula, goiter, swollen arid painful testis resulted from phlegm and qi accumulation together and congealing transforming into mass. 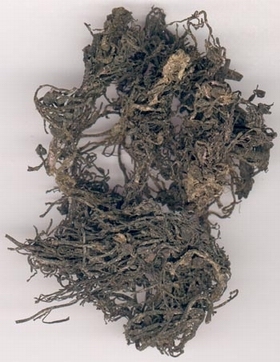 For scrofula and goiter, it is usually combined with other hardness-softening and phlegm-resolving herbs. For instance it is combined with Kun Bu and Bei Mu in Hai Zao Yu Hu Tang from Yi Zong Jin Jian. For swollen, distending and painful testis caused by phlegm congealing and qi stagnation, it is combined with liver-soothing, qi-regulating and phlegm-resolving herbs. For instance it is combined with Ju He, Kun Bu and Chuan Lian Zi in Ju He Wan from Ji Sheng Fang. This herb has the action of inducing diuresis and resolving swelling but the action is not strong enough. It is usually combined with diuresis-inducing and damp-draining herbs to enhance the action such as Fu Ling, Zhu Ling and Ze Xie, etc. Decoct 10~15 g. Proper dose in wine, or pill and powder.